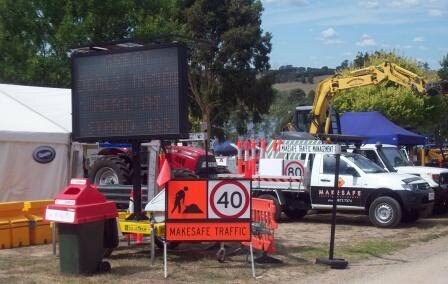 Makesafe Traffic Management supply all types of traffic management equipment in Melbourne and throughout Victoria. If you are looking to advertise your business using a VMS Board, have a long term construction site and need to install traffic signals or just need to rent a number of traffic management signs or bollards for your job site then give us a call at Makesafe Traffic Management. Whether you need equipment for a few hours or long term our team can assit you by providing a competative supply price and we will also arrange for delivery and assembly/placement of the items. Contact the friendly team at Makesafe Traffic Management to discuss your requirements phone (03) 8872 7345 alternately fill in the enquiry form and we will respond to you.